Club Penguin Cheats by Mimo777 Club Penguin Cheats by Mimo777: Club Penguin Favorite Song Reviewed By You! 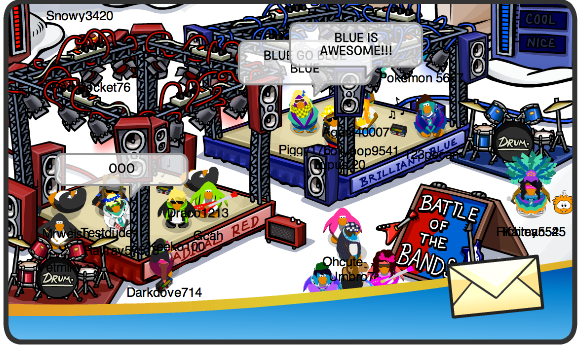 For next week's Reviewed by You, Club Penguin wants to hear what you like best about the Music Jam? I do NOT like the music in the nightclub. It quacks. I like the decorations in there though. u dont like the music in the night club???? That glitch has been there for a while. Its still a pretty funny one though. MIMO you kinda need to get over the fact that most of the stuff is for members only, i mean what do you think they pay alot of money for?? people wouldnt buy a membership if they didnt get much cool stuff. how do you think cp earns there money? so mimo cp has been really generouse this year. so i think you should just give cp a break about most of the stuff being for members couse thats how they make there money.